Ceol Binn is Irish for sweet music. 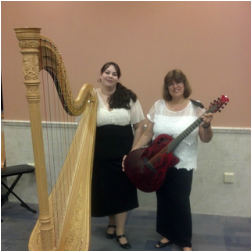 Ceol Binn consists of Stephanie Sussmeier (Harp) and Leslie Clarke (Guitar and Vocals). Ceol Binn’s repertoire includes Celtic tunes (traditional and rare), Classical, Opera, Pop and International. Ceol Binn performs for concerts and background music. You can see them twice a year at Avalon Library, NJ. Leslie Clarke, Soprano, attended Indiana University, graduating with a BA Degree in Spanish and a Masters Degree in Library Science. 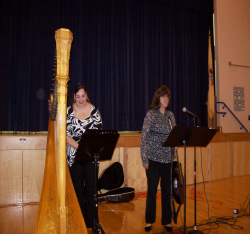 She studied voice with Martha Dubin and Paul McKay and has performed as a soloist with the Stockton Oratorio Society, Festival Chorus, St. Peter’s United Methodist Church, First Church of Christ Scientist in Ocean City, and with the Tuscany Singers at the Renault Winery and Joseph’s Restaurants. She has recorded with the Music Minus One Company on several recordings of Broadway Musicals. 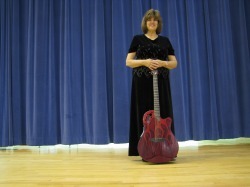 She has been performing on guitar with Stephanie Sussmeier, Harpist, as Ceol Binn since 2007.